Planning a whole new kitchen? Finding the right cooktop doesn’t have to be a challenge. While induction cooktops have their benefits, the range of NEFF gas cooktops are just as functional and supportive of your cooking needs. Don’t get caught out thinking gas cooktops are old fashioned, in fact with the clever engineering of NEFF cooktops you’ll be taking a step into the future. Most gas cooktop devotees love the visual control they have over the flame and as a result, the temperature of their cooking. With NEFF’s FlameSelect® function, the gas flame can be adapted to perfectly suit your favourite dishes. A numbered indicator as you’d see with induction cooktops allows you to set your flame to the exact same temperature every time you cook that recipe. Cleaning gas cooktops is a pain point for many people, but with the residual heat indicator you’ll know at a glance whether your cooktop is ready to be cleaned. The ‘H’ symbol means you definitely don’t want to touch the cooktop, while the ‘h’ indicates that it is nearly enough to begin cleaning. A lack of symbols on your hob means your cooktop is cold and safe to the touch. Whatever you want to cook you can always be sure to get the right size flame with the dual flame wok burner. This gives you the choice between one and two rings to improve the heat distribution and cook your favourite dishes perfectly every time. NEFF gas cooktops combine the classic feeling of cooking with flames with the technological support of induction cooktops for a fuss-free cooking experience every time. 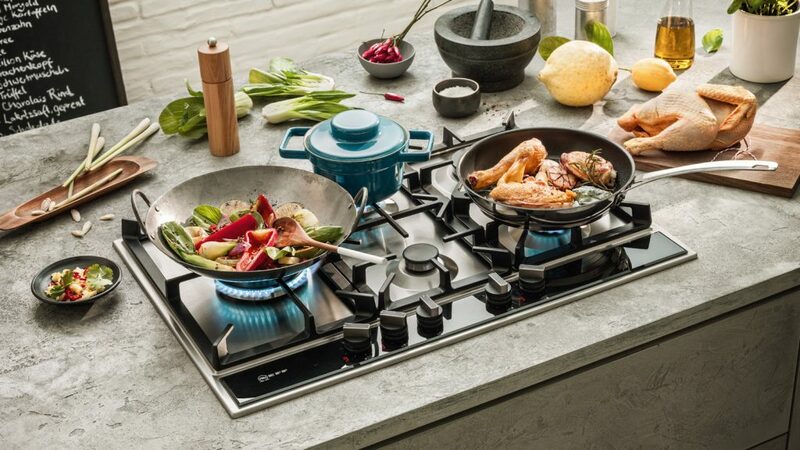 Sign up for a NEFF cooking demonstration to experience our range of cooktops for yourself.